Chilliwack – The first of four Fraser Valley townhall meetings for people to express their concerns to the Federal government, over the proposed twinning of the Kinder Morgan pipeline, was held at the Coast Chilliwack Hotel on Thursday morning. Some 60 people, mainly over the age of 40, filed into the main conference room to hear two dozen presenters. The panel was made up of Kim Baird, Past First Nations Chief with the Tsawwassen First Nation and a member of the Order Of Canada. Annette Trimbee, Metis and Presdident and Vice-Chancellor of the University of Winnipeg. Finally Tony Penikett, former Federal Chief of Staff of past NDP leader Ed Broadbent. Noticeably absent were any Federal, Provincial, Regional and Local politicians, although to be fair, their mere presence at such a meeting could and would have been a distraction. To note, that no one was loud or out of line. 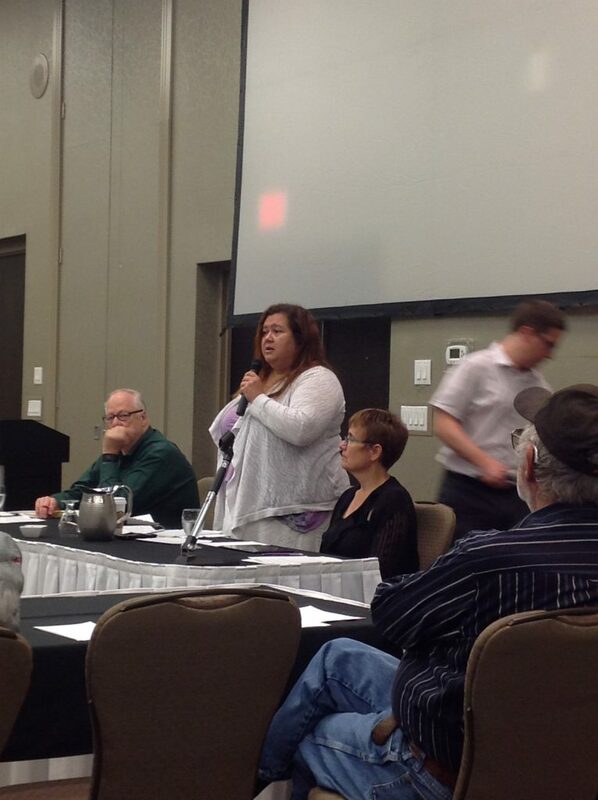 During the morning session, the majority of presenters were opposed to the pipeline expansion. They all cited safety as the number one concern followed by possible damage to the aquifer, shipping through BC waters to export, lack of real permanent jobs after construction and the lack of true local financial benefit. Obviously a few barbs thrown in against the process with the NEB National Energy Board and Prime Minister Justin Trudeau. Those were reserved to ” the reneging of promises that pipeline expansion should never have gone this far” and that the young Trudeau backed away from his campaign promises. There was criticism thrown at the actual process, that if it wasn’t for social media, no one would have known that the townhall meeting was on. The three member panel was only there to listen and take notes and not comment, although a few presenters tried to egg them on with their parting shots at the process. While First Nation elders Eddie Gardner and Ernie Crey were in attendance, there have been concerns that First Nations were not really consulted to have a larger role in this process. The Pipe Up Network and Stand.earth were also represented in the crowd. What are you doing to ensure the expanded pipeline will be safe? Pipeline safety is our number one priority. We have a mature suite of safety programs in place to prevent pipeline failures, to protect the existing Trans Mountain Pipeline and to protect the safety of the public, our workers and the environment. Our Emergency Management team is working to ensure when the expansion goes into operation, the existing Emergency Management Program (EMP) has been effectively enhanced to accommodate the complete system, which consists of the existing pipeline, the twinned pipeline and the associated facilities and infrastructure. Our goal is to operate, manage and protect the pipeline system, so the EMP never has to be used, but to be amply prepared in case a need should arise. As part of enhancements to the Emergency Management Program, a new Oil Spill Containment and Recovery (OSCAR) trailer unit has been placed in Abbotsford. Trans Mountain conducts more than 20 emergency response exercises, equipment deployment drills and training opportunities each year in both land- and marine-based settings. The most critical and responsible emergency preparedness strategy is to prevent a spill from occurring at all. What is Trans Mountain doing to minimize the Expansion Project’s impact on communities and the environment? Many conditions reflect feedback from community members and participants in the review of our Project. Feedback also came from residents who participated in our open houses, workshops and online opportunities. How will you minimize impact in the Fraser Valley? In the Township of Langley, a member municipality of Metro Vancouver, we are trenchlessly crossing the Hope-Redwoods natural area to avoid disruption to this environmentally sensitive area. Following construction, Trans Mountain’s objective is to return the temporary construction space and right-of-way to pre-construction conditions, to the extent possible. How will Fraser Valley businesses benefit from Trans Mountain Expansion Project? There will be an estimated $625 million in construction spending in the Fraser Valley. In addition to significant capital spending, procurement and contracting opportunities, construction activity will bring $58.6 million in workforce spending in Fraser Valley communities by local and non-local workers. Workforce spending includes accommodation, food, recreation, personal items, transportation, clothing and other purchases. NOTE: Construction spending and worker spending numbers are sourced from the Facilities Application for the Trans Mountain Expansion Project, submitted to the National Energy Board in December 2013, and are subject to change as the Project progresses. What direct local tax benefits does the Project generate? How will Fraser Valley communities benefit? How will water sources including drinking water and fish habitat be protected? Trans Mountain conducted studies along the proposed pipeline corridor to identify all watercourse crossings. Sensitivity to fish and fish habitat is a key consideration for selecting the crossing method to be deployed at each pipeline watercourse crossing. Where feasible, deviations from the existing right-of-way are proposed to reduce the number of watercourse crossings. To protect the Fraser Valley’s aquifers, heavier walled pipe and additional valves are being added to the proposed pipeline. When the Project is complete, the field research results will be available for comparison to results from post-construction monitoring. Post-construction results will also be compared to Health Canada’s Guidelines for Canadian Drinking Water Quality. How will you ensure First Nations’ interests are respected? Trans Mountain is committed to working with Aboriginal communities and groups in a spirit of co-operation and shared responsibility and to building and sustaining effective relationships based on mutual respect and trust to achieve respective business and community objectives. Trans Mountain works collaboratively with Aboriginal communities that might have an interest in the Project or have Aboriginal interests potentially affected by the Project. To date, 40 Aboriginal groups located along the pipeline and marine corridor in Alberta and British Columbia have provided written letters of support for the Project. BC Interior, Fraser Valley and Coastal First Nations are among those with final agreements. Métis Nation British Columbia, which represents Métis communities along the BC portion of the Trans Mountain right-of-way, has stated that it expects positive effects from the Project. 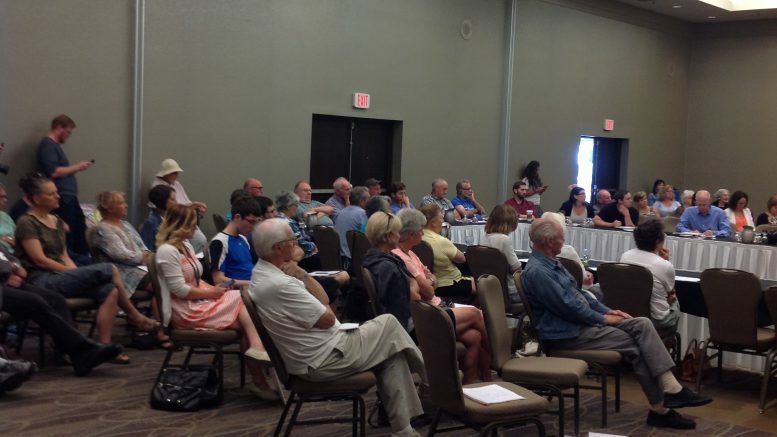 Be the first to comment on "Kinder Morgan Chilliwack Townhall Meeting"